As we approach Christmas, in the Southern Hemisphere we will also be approaching the summer solstice which marks the longest day and the shortest night of the calendar year. The term solstice comes from the Latin “sol” meaning the sun and “sistere” meaning to stand. At the solstice the Sun does seem to stand still for about 3 days as it reaches its furthest point from the celestial equator in its apparent journey around the earth. The ancients honoured the Sun as a life giving force. With the Sun being at its maximum power and impact, the solstice was celebrated as a potent time associated with the fruition of the plantings of spring and the bounty of the imminent harvest. Vital energy was considered most elevated in nature at this time of year. 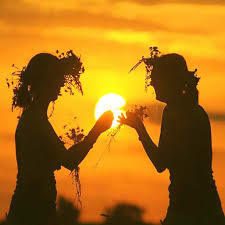 Midsummer or Litha celebrations started on Midsummer Eve with the hanging of herbs around houses for protection, braiding hair with herbs and flowers and wearing garlands for luck. It was considered a lucky time for marriage, and even today June and July are the most popular times for weddings in the northern hemisphere. The midsummer moon was known as the “Honey Moon”, associated with bee hives being rich in honey at this time which was used to make Mead, customarily drunk at wedding celebrations. The summer solstice was a fire festival of great importance where the Sun was ritually strengthened by the burning of balefires. The element of fire was seen as a purifying force to drive away evil influences and sacred fires were lit on hilltops to honour the space between earth and the heavens. This is a time to celebrate growth and life. Spiritually many traditions honour this as a time to recognise our inner power and brightness and to celebrate the light of consciousness within ourselves. Astrologically this is symbolised by the Sun in the birth chart. The southern hemisphere Summer Solstice will be on 21 December as Sun moves into the sign of Capricorn at 9.44 pm. The next new moon is at 8 degrees Capricorn on 29th December at 5.53 pm. Wishing you a Merry Christmas and Happy Solstice.